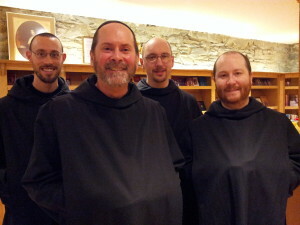 Benedictine monks of Silverstream priory (l to r) Dom Elijah, Dom Mark Daniel Kirby, Dom Finian and Dom Benedict Andersen. 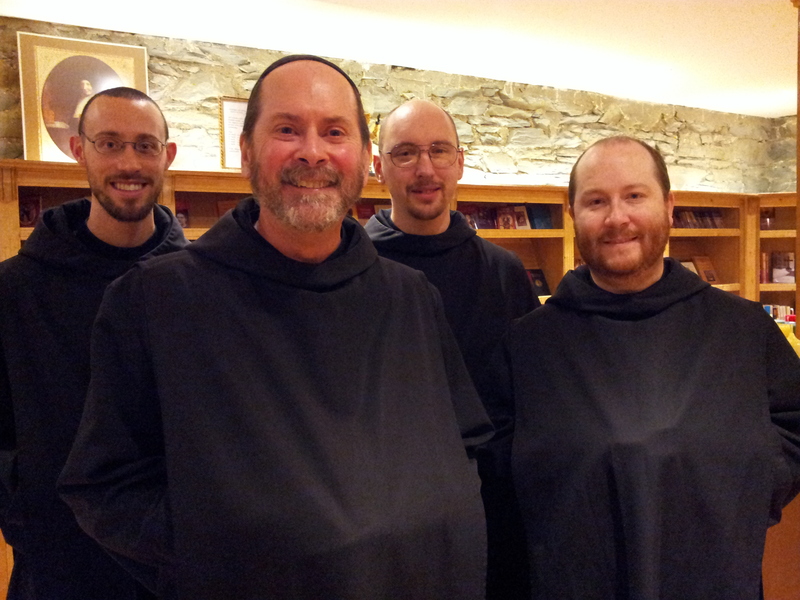 The fundraising deadline for Ireland’s newest monastery is just four days away and the Benedictine monks of Silverstream Priory still need €150,000. The community of five was founded from its parent community in the diocese of Tulsa in Oklahoma in the US and ended up coming to Ireland when the house the community was renting in Tulsa became too small. Prior, Dom Mark Daniel Kirby, explained that they need to purchase the Victorian-era monastery to make their future secure and to do major work to stem its descent into further decay. Silverstream Priory was built around 1845 on 15 acres of countryside near Stamullen. It had been owned by the Visitation Order of nuns from 1955. They moved out four years ago when their members needed nursing home care and they sought to sell the property to raises these funds. The price tag for the property was €750,000 including a chapel that is crumbling and in bad need of repair. The Benedictine monks intend to offer retreats to priests and religious and self-fund itself but it can’t do that until this financial hurdle is overcome. He said the way of life they were living as Benedictines was the same since the 6th century and that as Ireland had once been covered with monasteries, they were trying to keep that memory alive. “The Second Vatican Council taught that a local church is incomplete until it has a contemplative monastery. So it is important that we remain and that we continue to flourish because we are getting vocations and there are more on the way. But we must secure the monastery first,” he said. Silverstream Priory is currently the only contemplative monastery in the diocese of Meath. Though it has been in Ireland less than four years and is already attracting new candidates. One of these is novice Dom Finian who is from just outside Navan. The 34-year-old was prior to joining the monastery an instrumentation technician who worked in calibrating scientific instruments such as gas turbines. He was living in Bedford in the UK before he embarked on his vocational journey. The novice said his family would “always have been supportive of anything I tried to do” and that they “always knew that vocation was a possible life decision for me”. For the youngest member of the community, 27-year-old Bro Elijah, his family were not supportive. “My family is not catholic, they are Lutherans. I became a catholic in high school and it was early college when I made the decision to join a seminary.” It was a source of rupture and even to this day a source of grief. The Tulsa native originally became a seminarian for his home diocese but thanks to the amount of time he spent “going back and forth” between the monastery in Tulsa and the university he “became part of the furniture” and was drawn to contemplative cloistered monastic life. The Benedictine monks of Silverstream live their vocation under the Patronage of Our Lady of the Cenacle and have a special dedication to the sacred liturgy. When Dom Benedict, who was a member of the Tulsa community, pronounced his vows last year, he was the first Benedictine monk to be professed in Meath since the dissolution of the Abbey of Fore by the commissioners of Henry VIII in 1539. The monks have a number of young men both from Ireland and the US interested in joining the community but the monastery is badly in need of renovation in order to accommodate more men. For many years, he was a member of the Eastern Orthodox church. “I was an eastern orthodox seminarian and studied at the Russian orthodox seminary of St Vladimir’s in New York. Through the discovery of this monastery I came back to the faith of my baptism and just became enchanted with the Benedictine life – and that is how I came to join,” he explained. 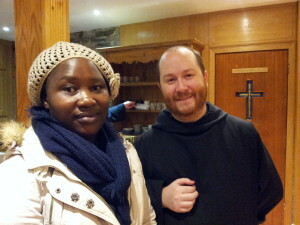 He told CatholicIreland.net that the monks normally we would not go out and about but there are exceptions. The invitation from the young Danish Catholics came through a 23-year-old Dane who comes to prayer and reflect at the monastery in Stamullen. 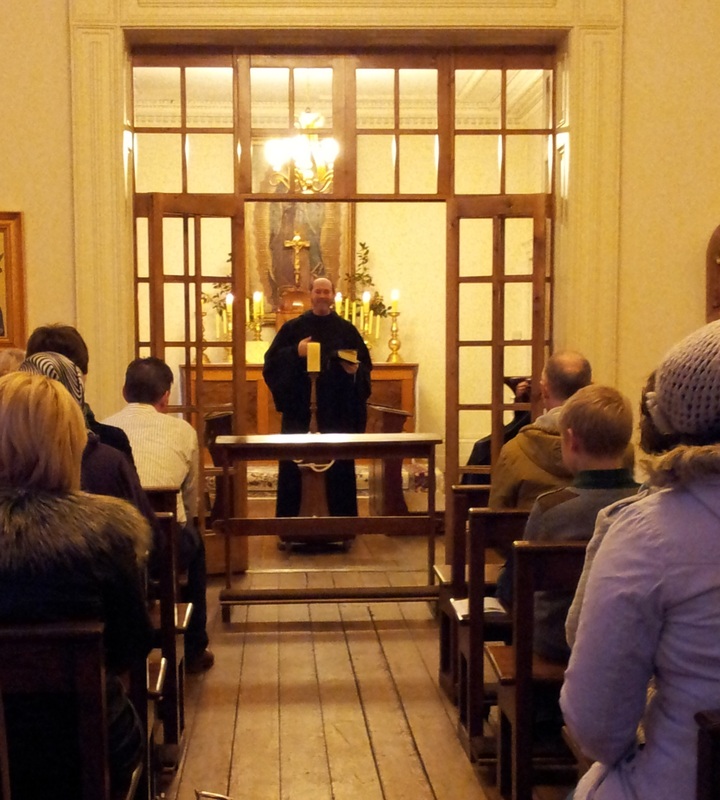 Dom Mark Daniel Kirby explains that he was recently baptised at St Kevin’s parish in Dublin’s Harrington Street.